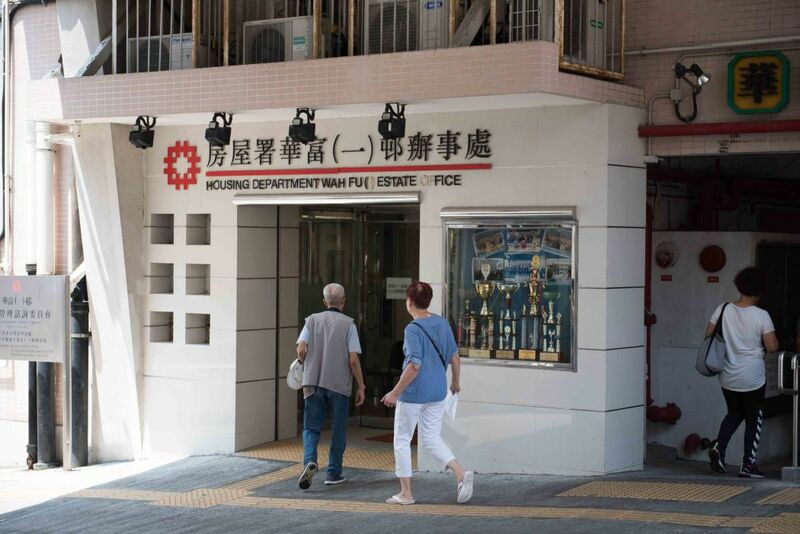 For residents of Pok Fu Lam’s Wah Fu public housing estate, practical concerns outweigh the lofty talk of political ideology in the upcoming election. The estate was first opened to residents in the late 60s and is known for its location by Waterfall Bay with a view of the sea. It was built following the government’s new town concept and was designed to be a self-sufficient community. 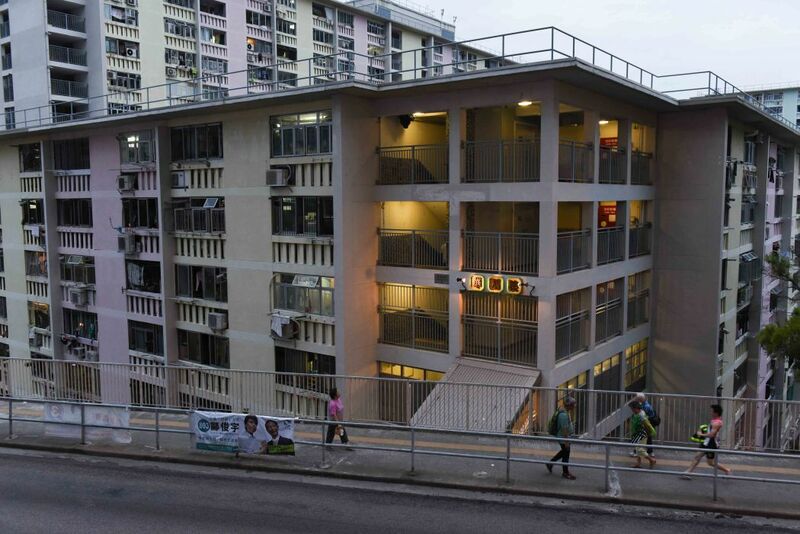 Near the entrance to Wah Fu is a private British school, and in the Pok Fu Lam area are several higher-priced housing developments including the Bel-air residence and Baguio Villa. 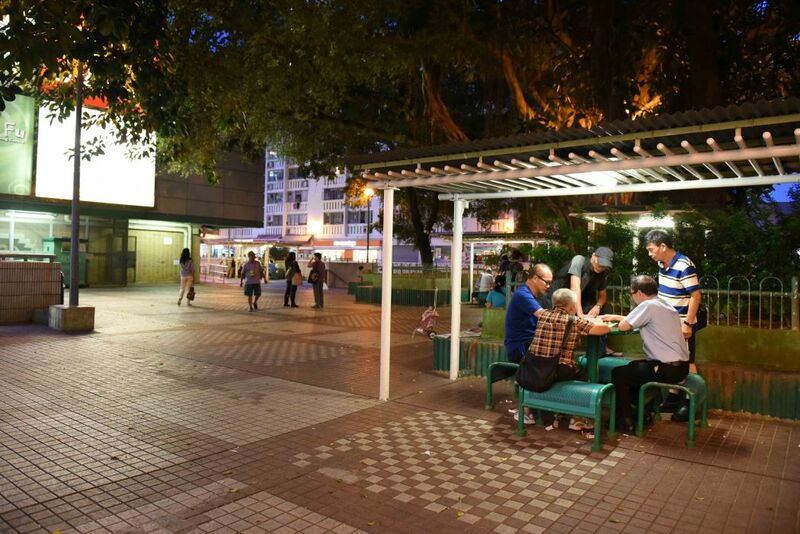 For retirees and those hanging around on a Friday morning, life revolves around the shopping centre in the middle of the development, where there is a wet market, McDonald’s, Maxim’s and an outdoor square where old men sit and chat or play card games. The bus station and bus stops are also situated in this central area. 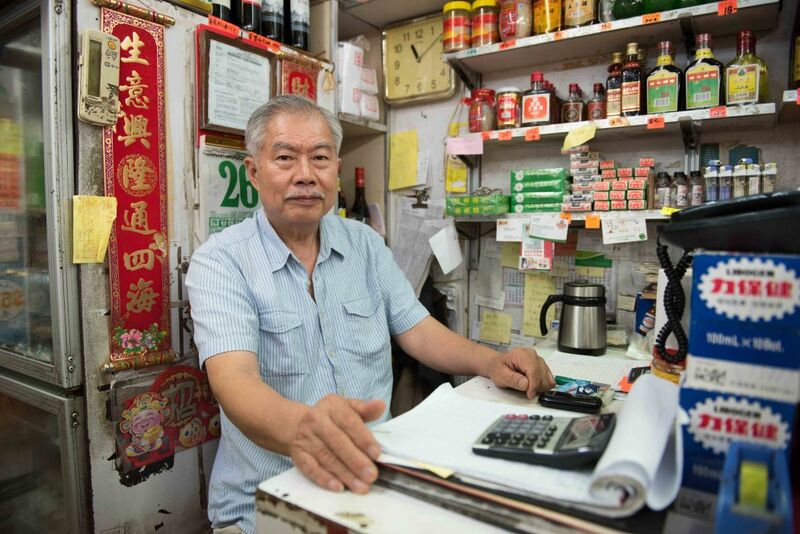 Mr. Cheng, who owns a shop selling dry goods and condiments in the wet market, says he is not voting in the next election, but had a lot to say about livelihood issues. He did not think voting would change anything and because common people can’t “see through politics,” it is hard for them to tell if the government is working, he said. Mr. Cheng. Photo: HKFP/Catherine Lai. “I don’t know about politics, I’m just telling you what’s in our hearts,” said Cheng, who says he often talks to people in the area about issues that affect them. A family shops at Wah Fu Estate. Photo: HKFP/Catherine Lai. 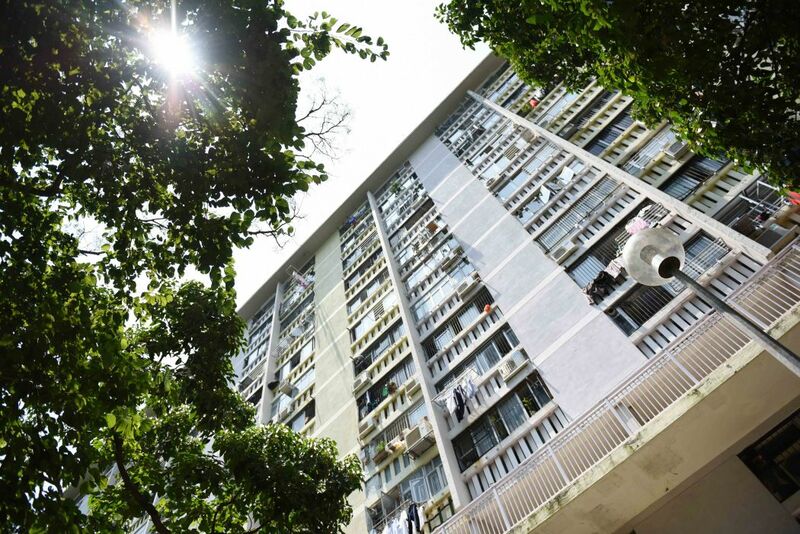 A refugee from Chaozhou, Guangdong, who came to the city because he was unable to go to school during China’s tumultuous cultural revolution, Cheng was nostalgic about Hong Kong before the 1997 handover, saying that people of his generation didn’t make a lot of money back then, but life was more relaxed. “The most important things to the people are the basics – clothing, food and shelter,” he said. He said he was most angry about house prices in Hong Kong. “I’m worried about the next generation.” He said he has several sons, who will not pay off their mortgages until they retire. 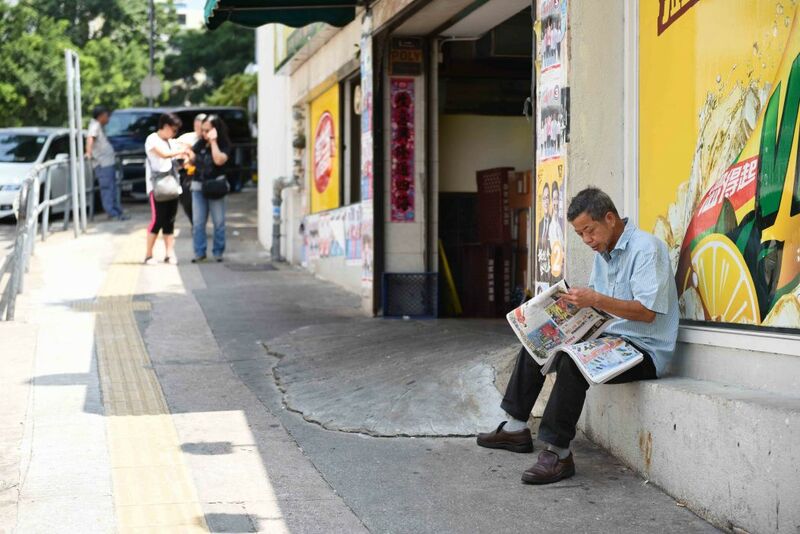 A resident sits and reads a paper. Photo: HKFP/Catherine Lai. 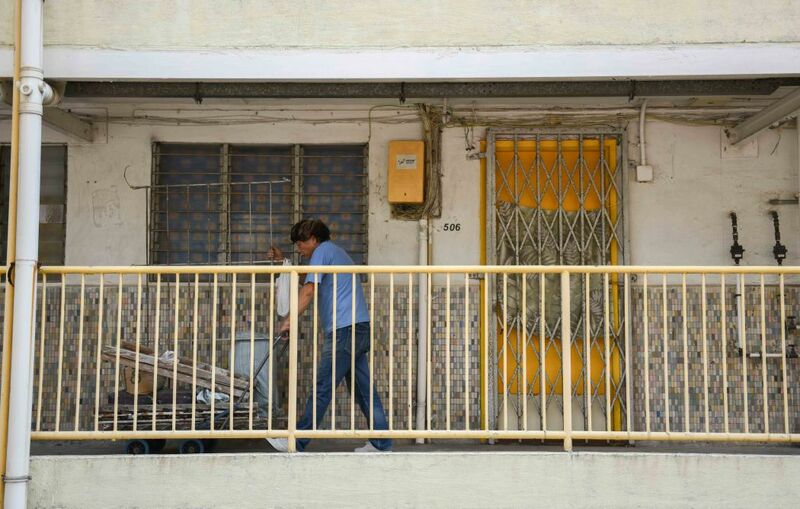 Mr. Leung Kam-shing, 63, a resident of Wah Fu 2 village who is disabled and moves around on crutches, said he will be voting for Kwok Wai-keung from the Hong Kong Federation of Trade Unions. He is voting for Kwok because he helped people like himself a lot, said Leung. The striped poles that Leung said the FTU helped install. Photo: HKFP/Catherine Lai. According to Leung, the FTU helped Wah Fu fight for the Rehabus service, a bus service for people with disabilities run by the transport department. 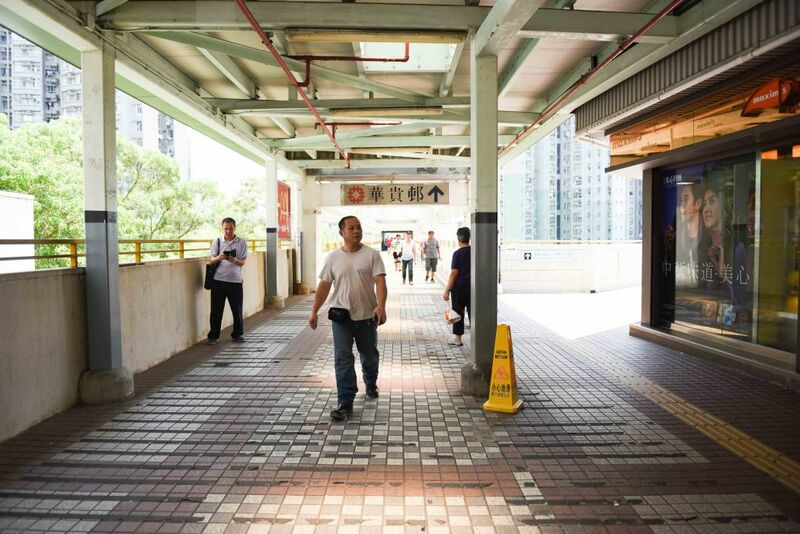 The Rehabus added fixed stops at Wah Fu (I) and Wah Fu (II) on April 1. 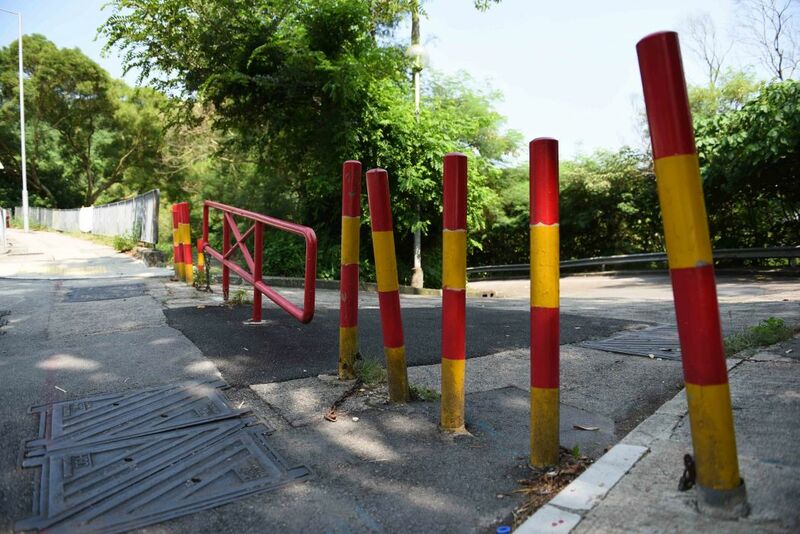 The FTU was also responsible for taking down a horizontal barrier on a road leading to Waterfall bay and replacing it with striped poles so people with disabilities can use the road, Leung and a staff member at the FTU office said. On Friday afternoon, the FTU office at Wah Fu, which a staff member told me had been there for six years, was bustling with activity. In the space of half an hour, three volunteers came in to get bundles of pamphlets to help distribute them. Currently, the FTU has six seats in the Legislative Council but hopes to win one more in the election. Kwok is running in the Hong Kong Island geographical constituency to free up his seat in the Labour constituency for another FTU candidate. Another volunteer there, Ngor Jie, who was loading materials into a shopping cart, said she had been volunteering on and off for about a year. She said she is loyal to the FTU because they helped her with some personal issues, which she declined to discuss. 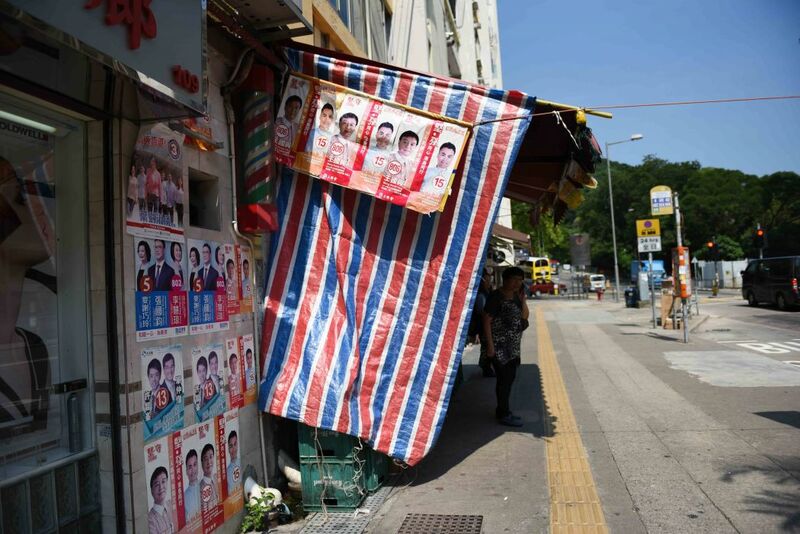 Chai Man-hon, the incumbent District Councillor of the Wah Fu North constituency, said his party emphasises livelihood issues along with political ideology during elections. The Democratic Party’s focus on livelihood issues sets them apart from other pan-democratic parties and partly accounts for the party’s success, he said. Some parties don’t have the ability to cover all districts, but his party can get people on the ground, said Chai, who has been in office since 2003. Chai said voters could be alienated by detailed planning processes and political ideologies. The party uses district-specific pamphlets to discuss livelihood issues. Their pamphlet for the Southern District mentions the Democratic Party’s proposal for the new MTR line in the Southern District and mentions other projects in the area, including the Wah Fu Estate redevelopment. On the back of the pamphlet it addresses political ideals like safeguarding One Country, Two Systems and the rights of Hongkongers. Winning voters over on livelihood issues could give them confidence to support the party’s policy direction like supporting a more open society, said Chai. Nicholas Lau, 25, who was seeing a friend off at the bus stop, said he would be voting for number 7. He had forgotten the candidate’s name, he said, but it was a localist party. 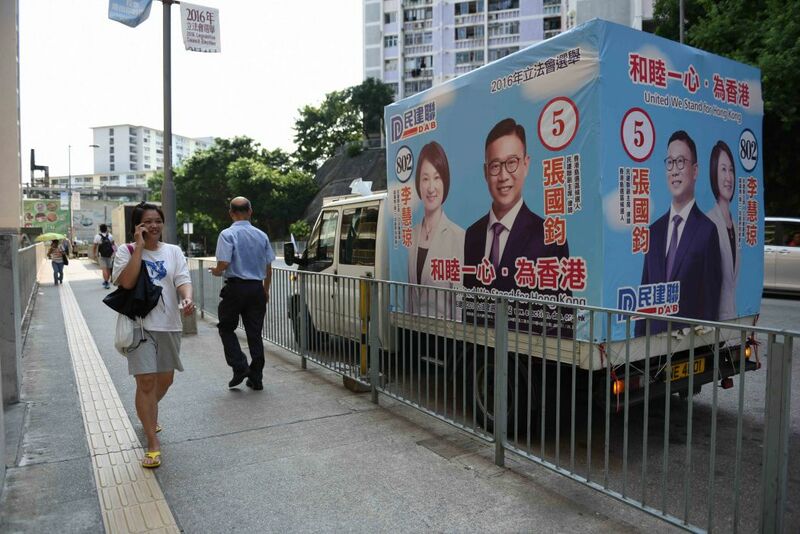 In fact, number 7 on Hong Kong Island’s list of candidates is Cheng Kam Mun of Civic Passion. 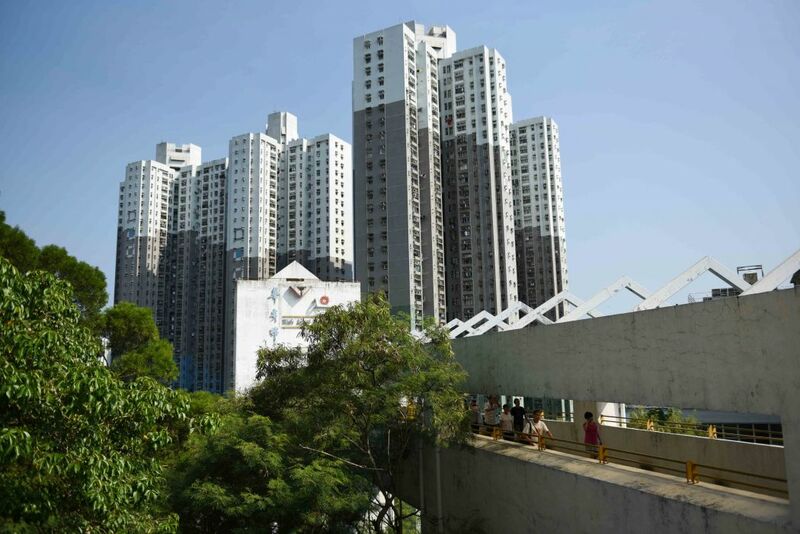 “What affects my life isn’t the wealth gap or rich people, it’s the government’s policies, or the mainland interfering with HK affairs,” Lau said when asked about the more expensive housing developments nearby. 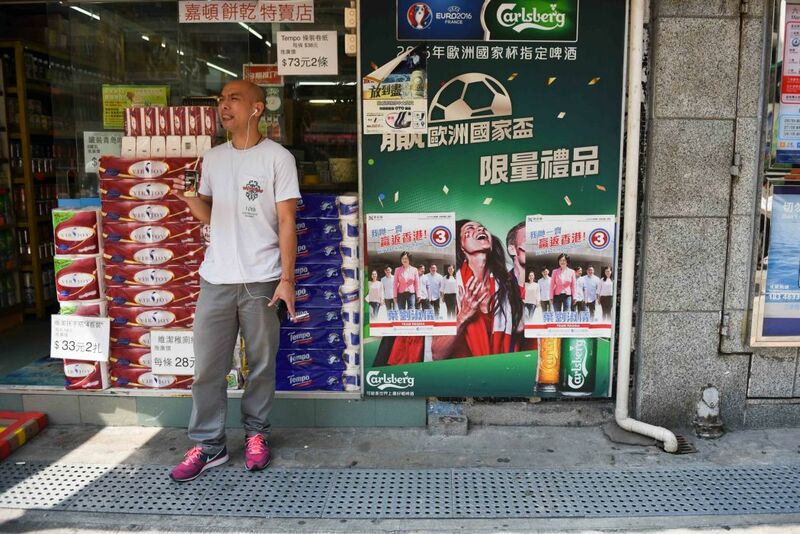 A man in front of a store in Wah Fu. Photo: HKFP/Catherine Lai. 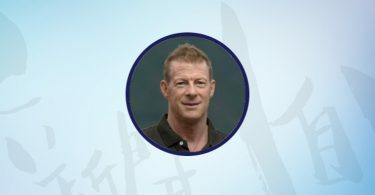 “I don’t think it’s possible to solve these problems, but at least [localist parties] can tell people what Hongkongers want,” Lau said. The 2016 Legislative Council election is scheduled to be held on September 4. The full list of candidates running across districts and constituencies can be viewed here.